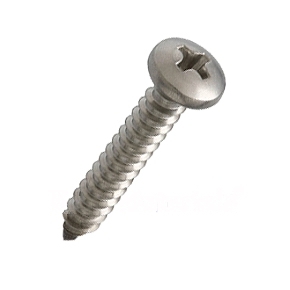 PRODUCT: #10 X 1 inch Stainless Steel Sheet Metal Tapper Screw, A-Point, Phillips Drive Pan Head, 304 Stainless Steel. 1000/Box. Price/1000. • Designed with unique head styles, drill point configurations and material types to meet performance requirements to attach standing seam roof clips. • Engineered profile features preventing panel damage from fastener head contact. • Installation torque drive control for uniform installation performance. • Available in sizes from #4 x 1/4 to #14 x 4 inches.